The nine-person city council has failed to advocate for city residents, according to Fatima Bell. She is running for one of three available at-large council seats to change that, she said. “The people need an advocate,” said Bell. She said there’s a “disconnect between people and politics” in the city. She said the disconnect is particularly pronounced among young people, who have not been engaged by elected officials. 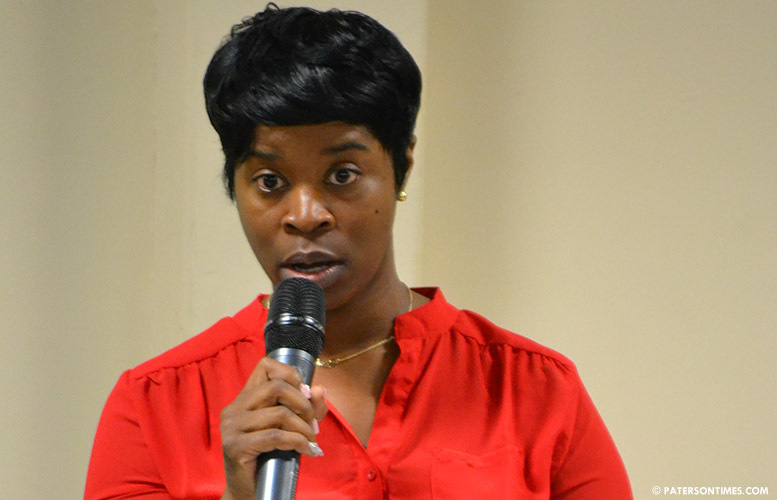 Bell, 33, has taken her campaigns to students at Passaic County Community College and William Paterson University. She wants more millennials to be involved in politics. “The things they should do to build up the city, they don’t,” said Bell of the council. If elected, she will have to take actions on variety of issues. Bell sounded off on some of the issues. She said she plans to ensure the next mayor appoints city residents to cabinet level positions. “All the directors have to live in the city,” said Bell. On crime, she said she is not sure whether the hotspot business curfew ordinance that forces businesses in high crime areas to close at midnight is working. A police report stated there was a 79-percent drop in non-fatal shootings in designated zones. “There’s skepticism about the whole thing,” said Bell. On taxes, she plans to take a common-sense approach. “If I’m on the city council, I’m always going to take a common-sense vote,” she said. Bell said she is not going to be an automatic vote in favor of the budget. On tax abatements, she said the city needs to avoid decades long deals. On renovating the Hinchliffe Stadium and spending money on the Great Falls, she opposes borrowing funds to make improvements. She said she is not sure what is being done at either of the two sites. “I think, if we don’t have the money to spend, we shouldn’t be borrowing money to fix that up,” said Bell. Bell has not made big promises to voters. She has received applause at different community forums for her honesty. For example, at the televised debate last week, Bell admitted she went through the budget in the last 48 hours. Bell said bad promises over the years has turned off voters. She hopes her honest campaign attracts young voters to the polls. Bell is a full-time student at William Paterson University. She is pursuing a degree in sociology and psychology. Prior to that she attended both John F. Kennedy and Eastside High School. She received her high school equivalency and an associate’s degree in human services from the Passaic County Community College. Wishing you all the best, its young people like you will be in effective leader for this beautiful city. I hope more young people will aspire to lead in the near future. I could talk for ever on tax injustice here in this city but it will go no where. You appeal , you pay and hope for the best. One thing I will say some of the members on the council, are very ineffective and should leave. There should a term limit for these officials. Layoff should be the last avenue to explore.